Today was our only full day in Dublin and our last day before flying home. 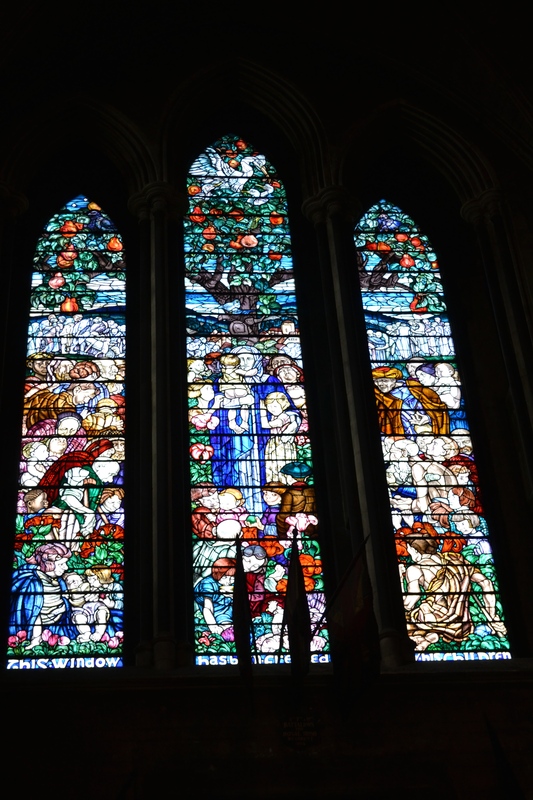 It might be Good Friday, but we were still going to use every minute to explore. 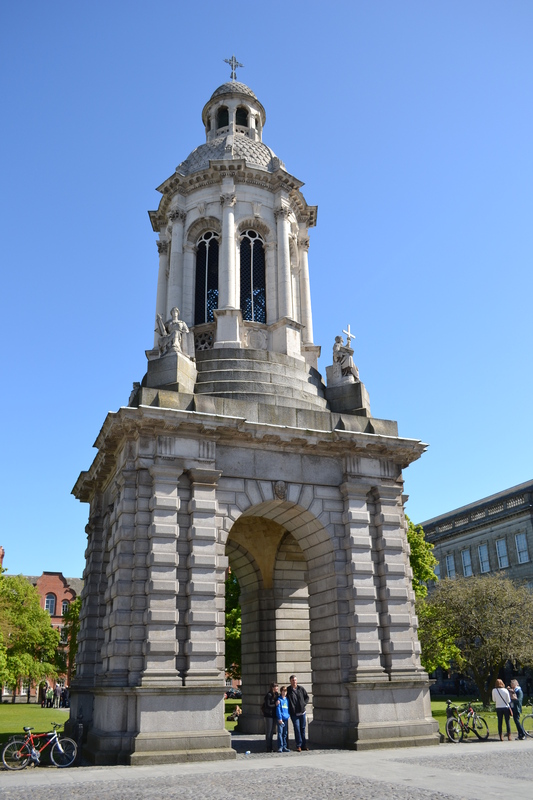 First stop was the campus of Trinity College. Founded in 1592, that’s all. Tours and the library didn’t start until later in the day, so we just did our own little stroll around campus. I don’t think I’ve yet said that it was another gorgeous day, not a cloud in the sky, 50°F, just a little wind. We certainly lucked out with the weather. 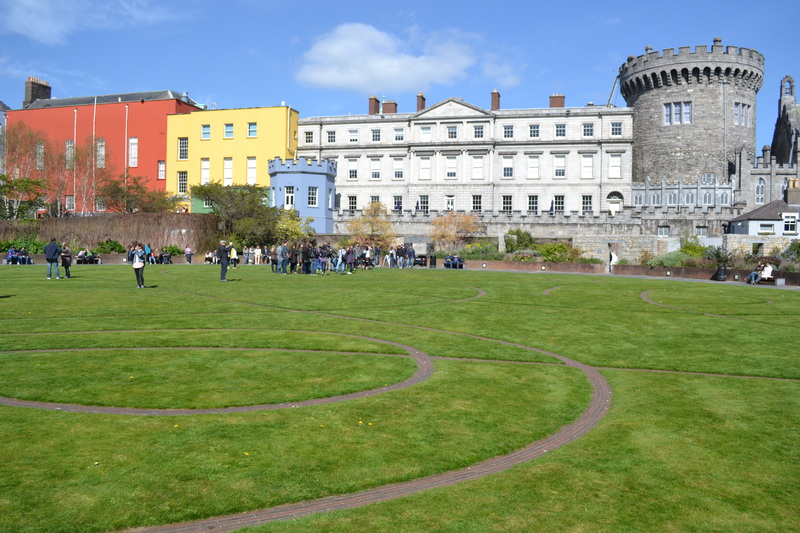 We then walked over to Dublin Castle. I remarked to Ellen today that Ireland has been different from most European countries we have visited, in that there was no royalty, no palaces and pomp. Ireland is a relatively new nation, with invaders having written most of the history. The castle was closed for the holiday, so we couldn’t go inside, but we enjoyed walking around the grounds and to the garden behind. 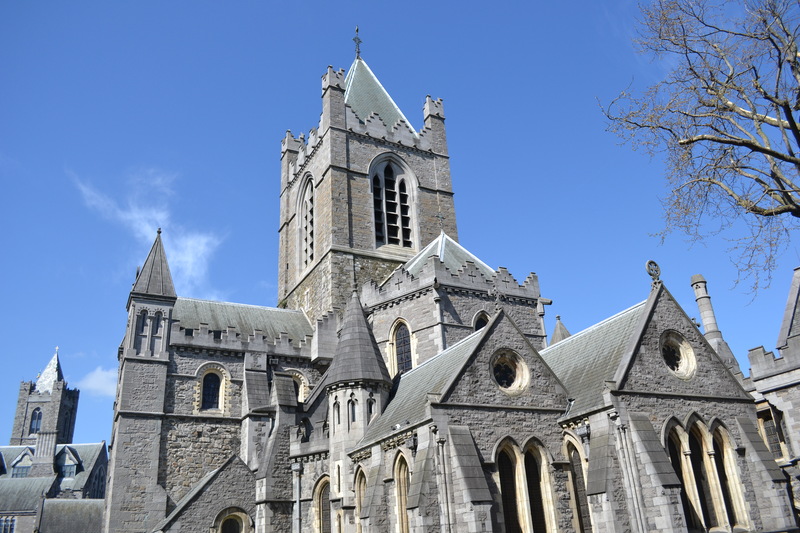 There was one more church to visit, Christ Church Cathedral, which dates back to the 11th century. We don’t have anything like this back in the States, right? We stopped at Bobo’s Burgers for lunch. Mostly because Ellen liked the name. Plus, easy to have a burger without a bun for Passover. Now, back to Trinity College. We took a walking tour this time, narrated by a student. We found the history of the college interesting, but mostly wanted to see the long room. 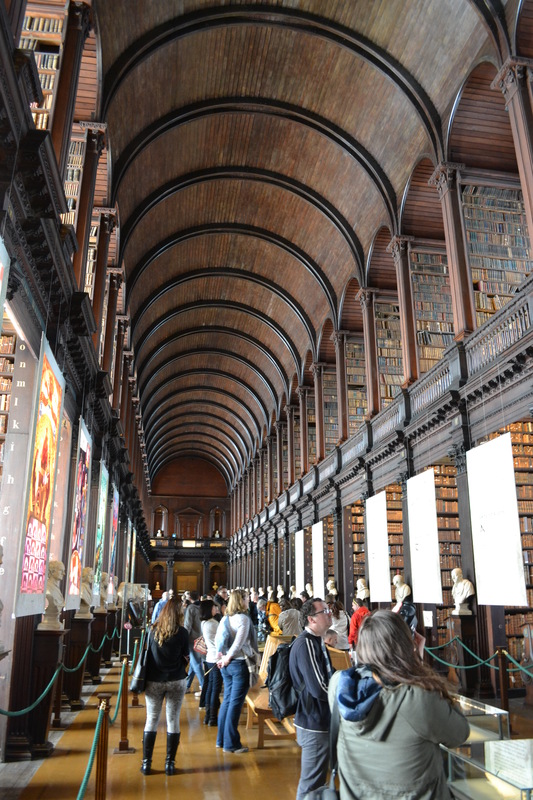 Also in the old library is the Book of Kells, a book with 4 gospels that dates back to 800. But the long room was the highlight. 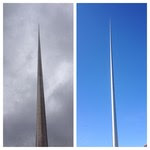 We crossed the River Liffey to get another view of the spire. So different today versus yesterday, right? 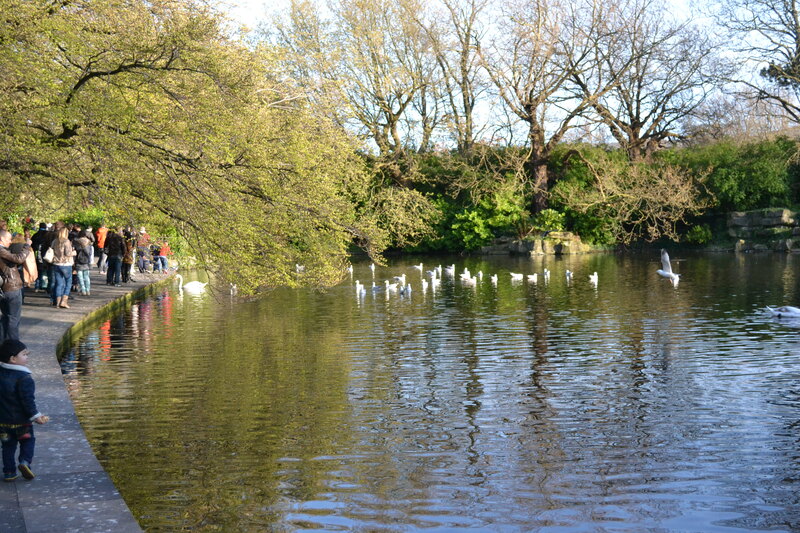 Our final stop on the way home was the Victorian Park, Saint Stephen’s Green. We had walked past it several times, but never entered. 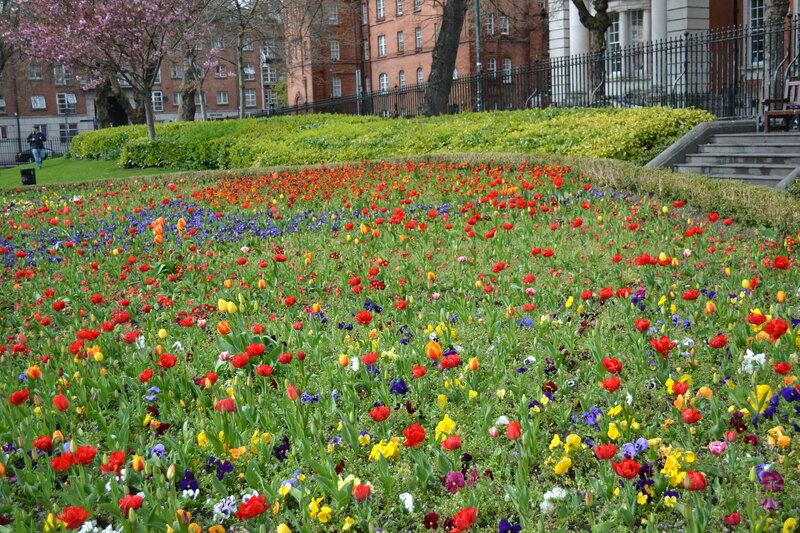 All cities need green, open space. We had left the hotel this morning with a request to make a dinner reservation at the hotel’s restaurant. We got back to the hotel at 6:30pm and found that they were full. But the concierge had made a reservation for us at another restaurant, just a 10 minute walk away. So we had a delightful meal at the Pig’s Ear. We shared the Earl Grey tea cured & smoked salmon as our appetizer. Ellen had the organic Scottish Salmon and I had the beef cheek. And no one in the restaurant (or in Dublin) had alcohol with their meal. Yet everyone survived! I hope you’ve enjoyed traveling along with us. If you could, like this post on Facebook, Twitter or WordPress (all 3 if you’d like), just to let me know you were reading along. Marketers always want to get feedback. 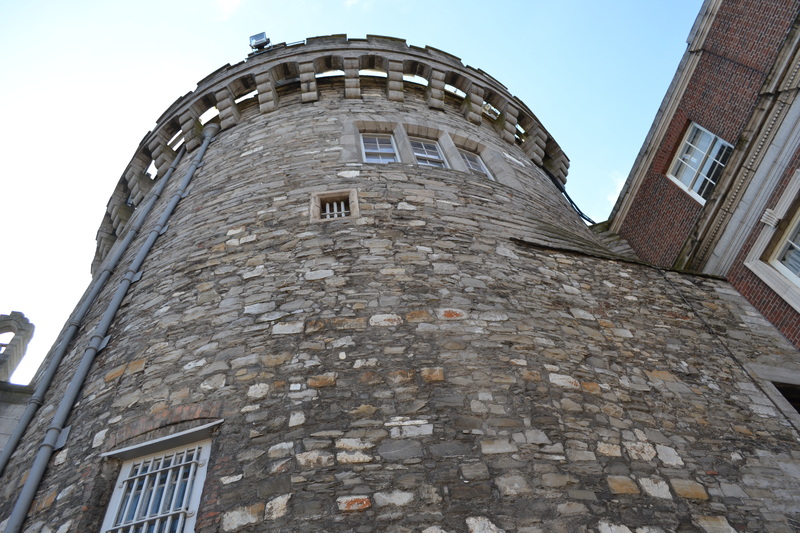 Today was the day to drive back to Dublin, ditch the car, and become urban explorers again. We drove the 2 hours or so from Galway to Dublin this morning. Am proud to report that driving on the right side of the car and the left side of the road is now complete, error free (except Ellen will tell you I hit a few curbs). It got easier each day, after a couple of weeks I’m sure it becomes second nature. Car rental math: we drove 848 kilometers on 42.3 liters of diesel fuel. That translates to 47mpg, not bad for a non-hybrid vehicle. The US could use more diesel cars. Also, gas at €1.47/liter translates to $7.72/gallon, which would encourage everyone to be more fuel efficient! We dropped the car off at Hertz and took a cab back to The Merrion Hotel, the same one we stayed at Saturday night. Our cab driver was an interesting woman, she chatted with us about our travels and the upcoming Good Friday holiday. She told us there won’t be any alcohol sales tomorrow, but that won’t be a problem because the Irish don’t drink as much as they are reputed to. Hmmm. 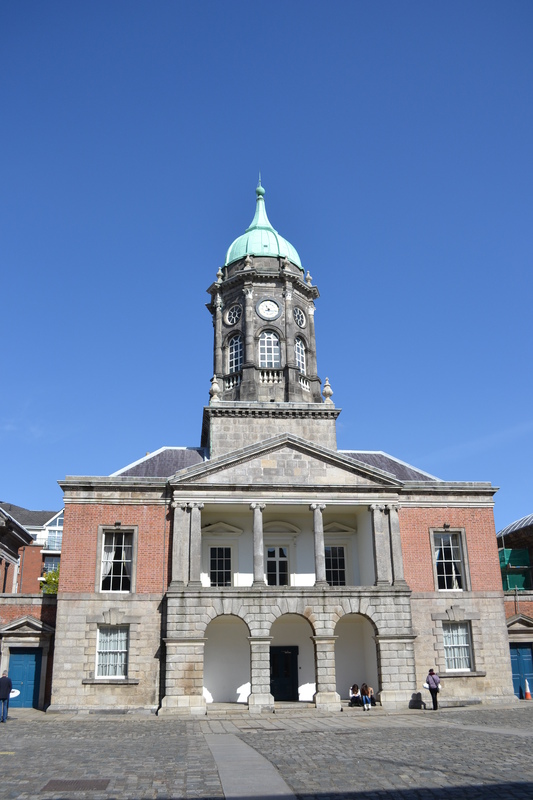 We had not really explored Dublin before, so we wanted to start with a walking tour. 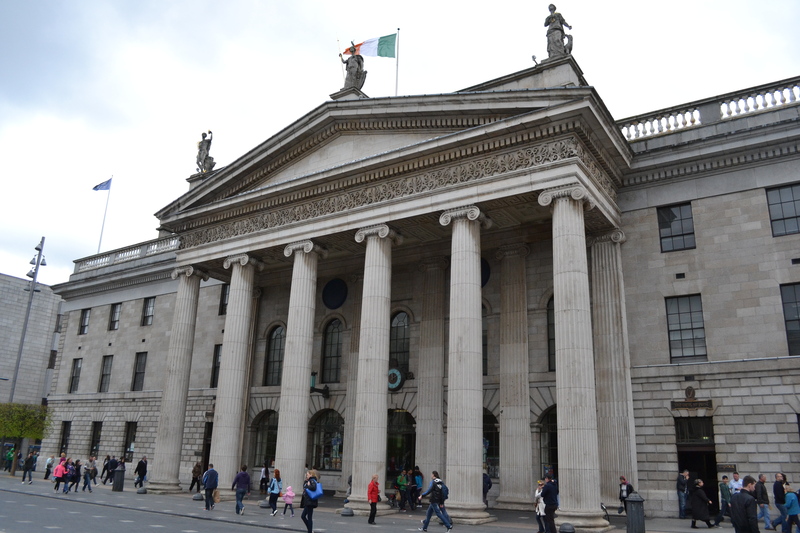 We followed RIck Steves tour up O’Connell Street. As you can tell, the sky was not as clear as the last few days, but there was no rain either. 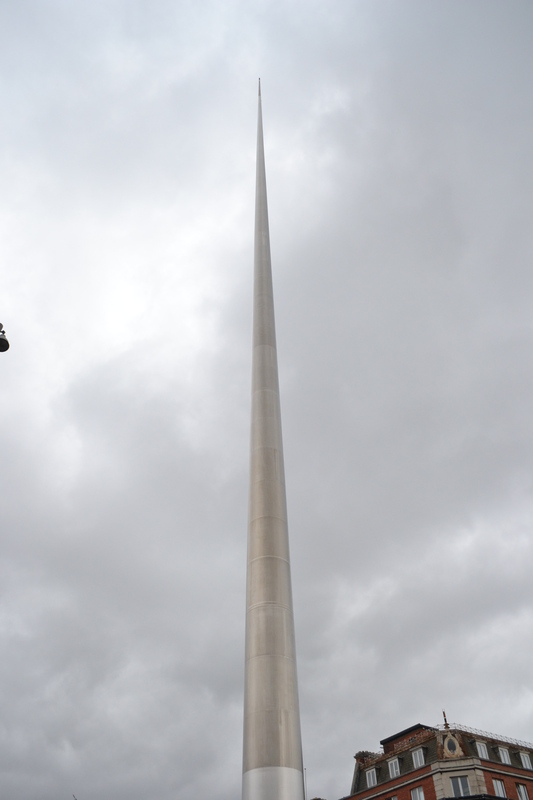 Here is the €5 million spire that we understand Dubliners are not especially keen about. 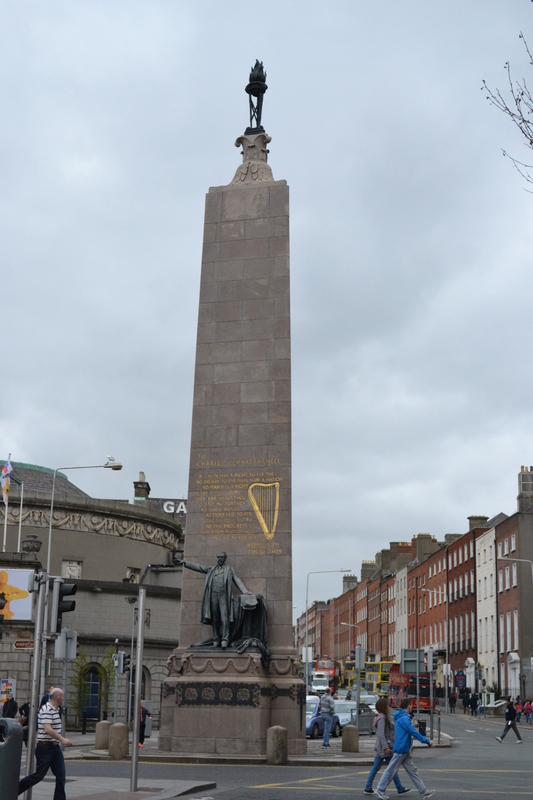 Lot’s of statues along O’Connell Street, honoring those who had helped gain Irish independence. Near the end of our walking tour, we happened past the Ambassador Theatre, and saw that the Art of the Brick exhibit was in town. 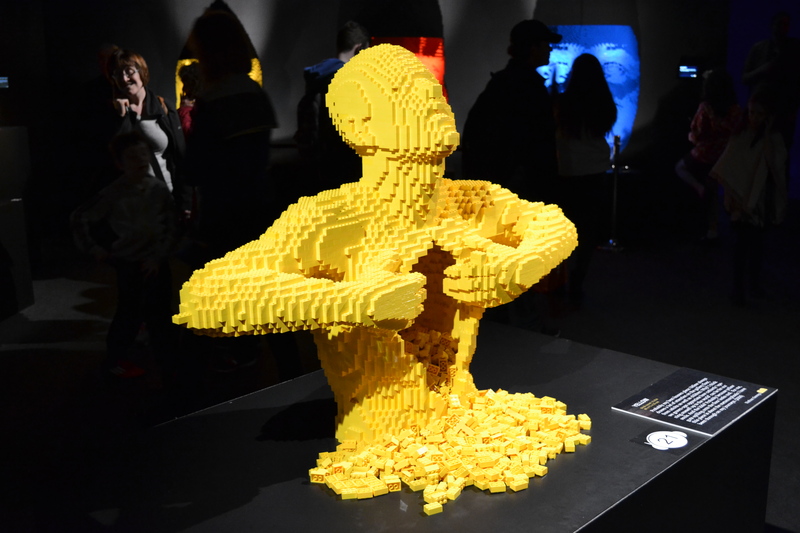 Ellen was aware of Nathan Sawaya’s work, I wasn’t. We were able to get tickets immediately and I was so glad we went in! 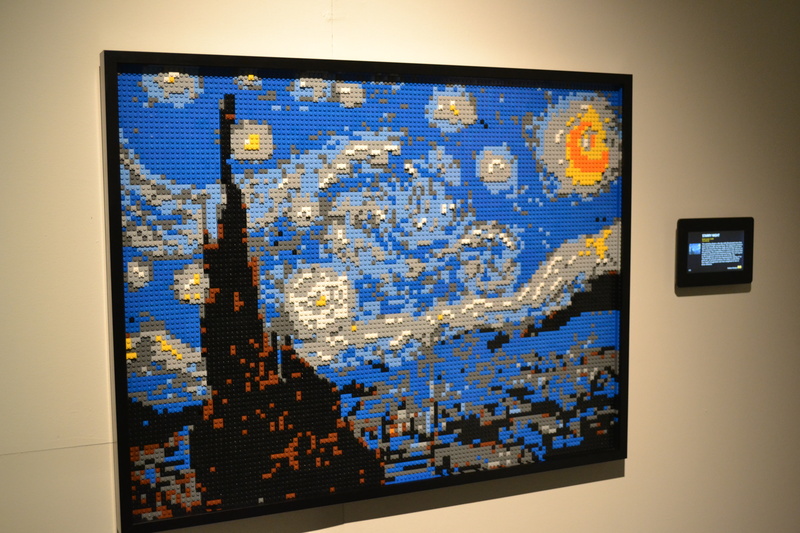 Some just amazing works of Lego art. 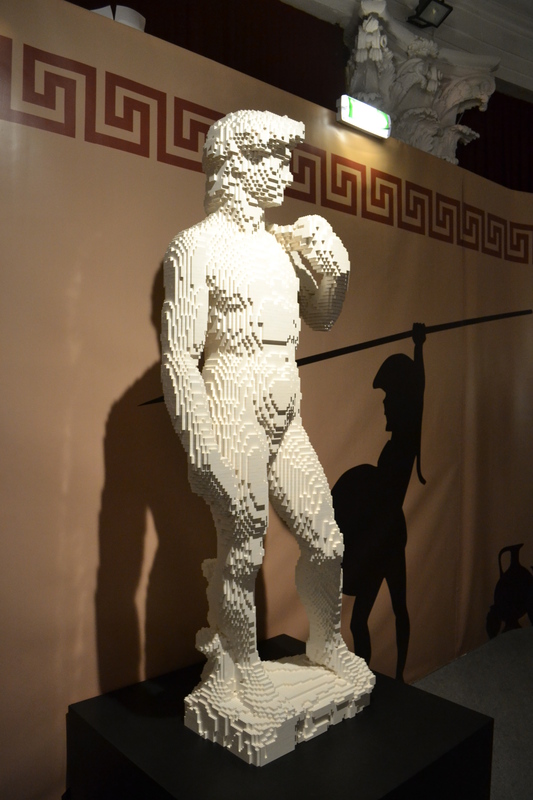 We found that there is an exhibit of Art of the Brick in New York, go see it if you can! We next wanted to go tour the Old Jameson Distillery. Neither of us are big whiskey drinkers, and I can’t drink whiskey during Passover, but even so, it seemed like fun. 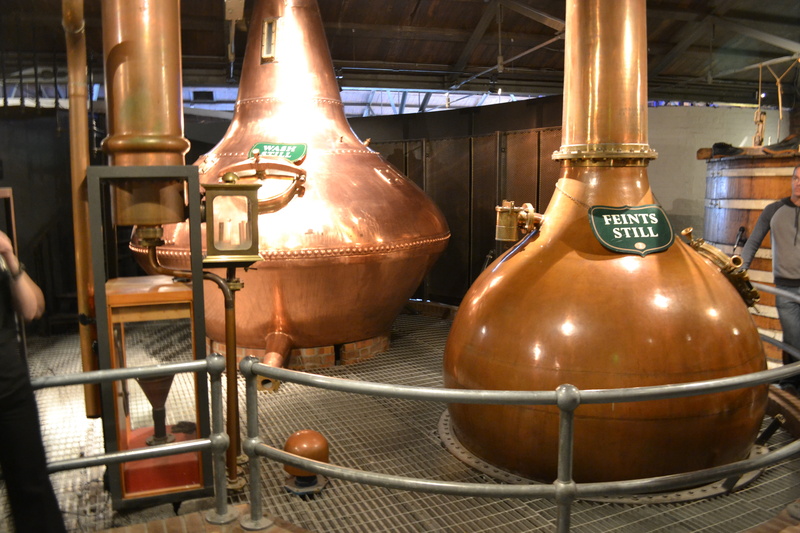 The whiskey is now distilled in Cork, but the old distillery is kind of like a museum. We learned how they make the whiskey, Ellen had a sample at the end, and we bought a couple of small bottles for when we get back. I think I’m going to wait until our Waterford tumblers arrive, it seems fitting. We found dinner in the Temple Bar district at Toscana. Ellen has a risotto dish, I had a caprese salad and grilled chicken. We shared chocolate gelato and then walked back to our hotel. It was a full day, even with getting back to Dublin at noon. We’ll make the most of tomorrow, our last day of sightseeing. Our week in Ireland got off to a great start! Everything in the travel to Dublin worked out perfectly. Having recently been granted Global Entry status, we also got TSA PreCheck, so we went to a separate security line, didn’t have to take off our shoes, belts and jackets nor take our our liquids. Ellen had bought a couple of passes to United’s lounge off of eBay, so we could relax there before the flight. Our plane was 1/2 an hour late because of “airport conditions.” We thought that meant something at Dulles, but learned from the captain later that the delay was because Dublin couldn’t handle our plane if we arrived early. We were in regular economy class, but had decent legroom. The plane took off about 11:00pm EDT. We both fell asleep and it was breakfast time before you knew it. We landed around 10:00am Dublin time, got through immigration and got our luggage. We found the 700 bus which for €28 round-trip will get the 2 of us to and from the airport. The bus ride was about 1/2 an hour, and allowed us to see some of the city along the way. We were let off within 2 blocks of our hotel. We are staying tonight, and then the final 2 nights, at The Merrion. We have a delightful room, with a king size bed and a humongous bathroom. The room wasn’t ready when we arrived, so we dumped our luggage and took off. Of course our first stop was to get SIM cards. This was the easiest purchase ever. Walked in to the 3 Store, said we wanted SIM cards, €20 each for unlimited data, salesman installed them, we paid and were out of there. Next stop was lunch and then walking. I did make one mistake (so far). Ellen does the itinerary and hotel reservations, I’m responsible for car rental, phones and electronics. I had assumed that Ireland used the 2 prong European electric adapters. I was wrong, they use the weird 3 prong ones like the UK. So we had to stop at a few shops until we found adapters that will work here. Wasn’t too big a deal. The weather has been as expected, unpredictable. It changed from sunny to windy to cloudy to dark cloudy to rainy for 5 minutes and then back again. Never get used to it, it will just change again! 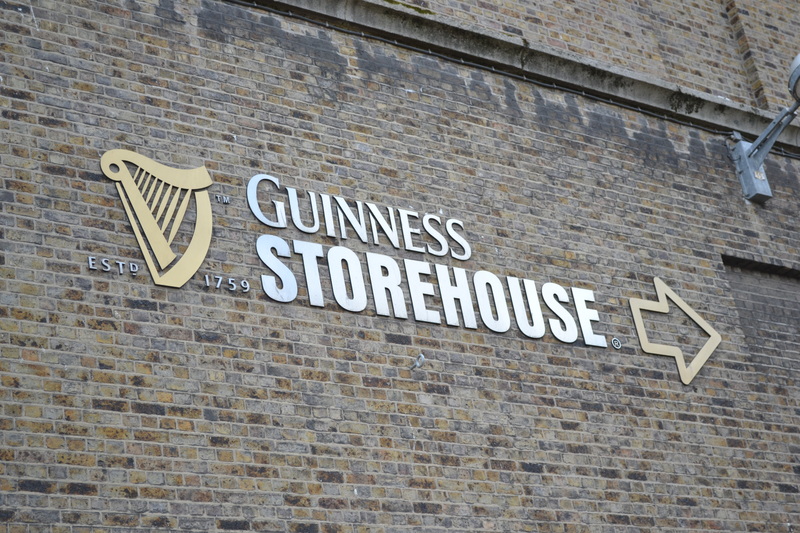 We were headed for the Guinness Storehouse, because, well, we’re in Dublin. 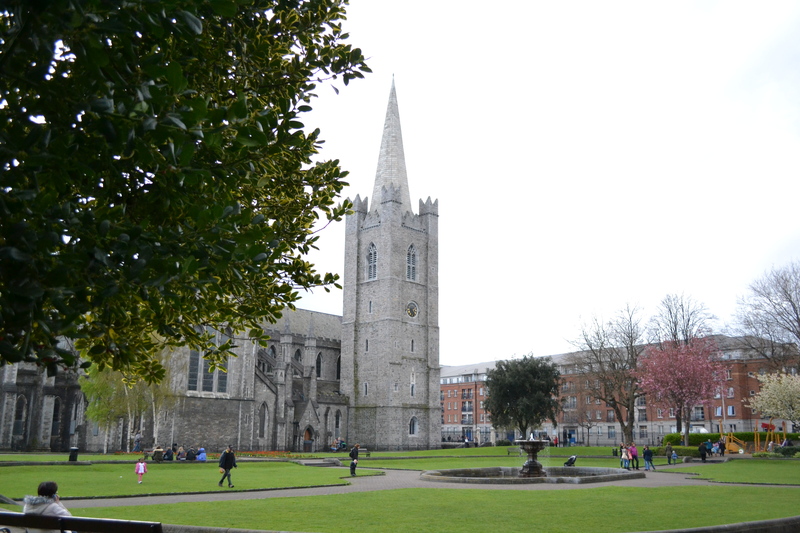 Along the way we stumbled upon St. Patrick’s Cathedral. The grounds were beautiful and we thought we should go in. 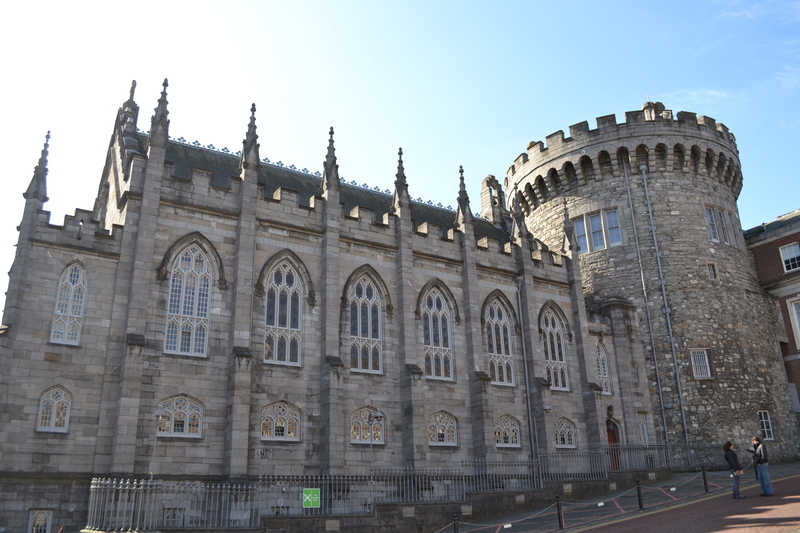 The church was full of Irish history, we read about it from the guidebooks and walked around. 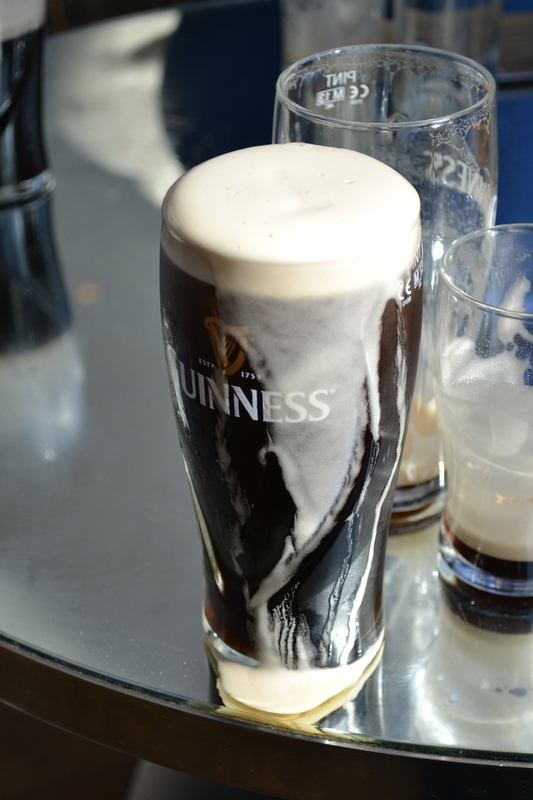 Our hotel bellman had told us of the magic of Guinness; the wonderful beer that doesn’t travel well, so always tastes best in Dublin, the secret to a good poor (45 degree angle, fill 3/4, let sit, and then top off) and how Guinness invests in line cleaning in every pub that serves their beer. True or not, touristy or not (and it was), we thought we’d go. It told the story of the hops, barley, yeast and water, and then the special manufacturing practice that makes the magic happen. It was crowded and we skipped some of the tour to get up to the top and have a pint. I don’t think I’ve had Guinness draft beer before. 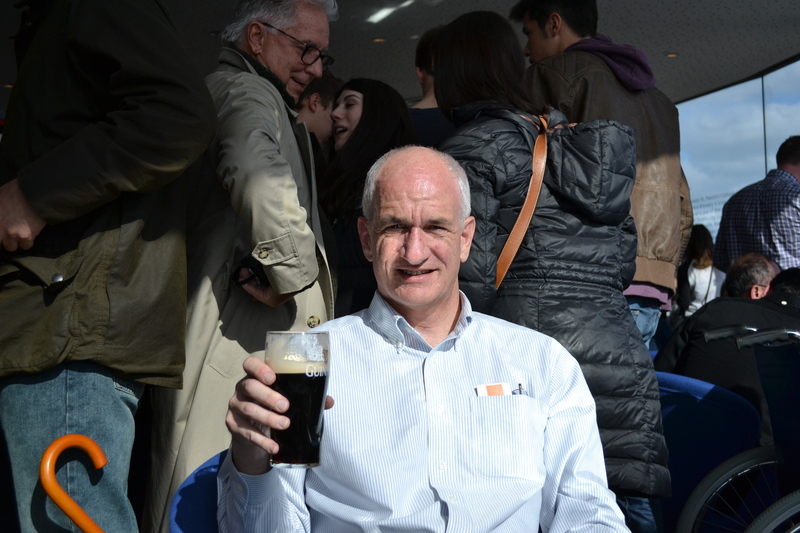 It was very tasty, something to be enjoyed with some sun even on the top floor. We stopped for tea and sparkling water on the walk back (Guinness was about a 1/2 hour walk from our hotel). Ellen searched for a dinner place, and we ended up at the Ely Winebar, just a block from our hotel. We had a haddock appetizer, then both had different lamb dishes, accompanied by a carafe of Burgundy wine. We capped it off with a chocolate tart dessert, yum! We didn’t rest at all, so are pretty exhausted and it’s an early night to bed. Tomorrow, the fun of driving begins!